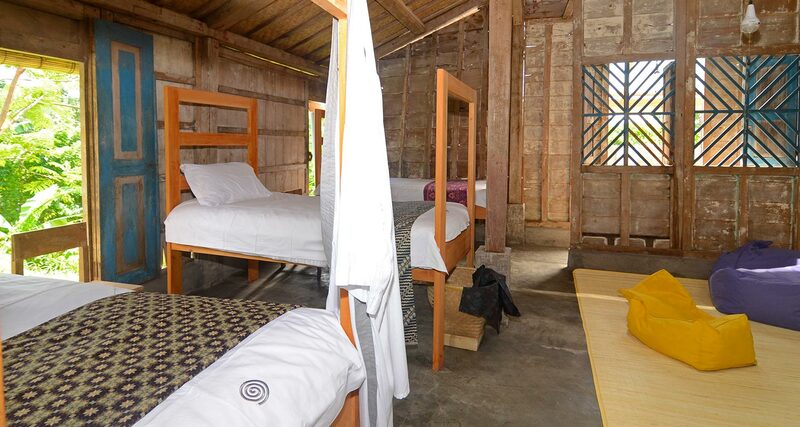 All accommodation include a hot shower, of course, a mosquito net, 100% cotton sheets, a down comforter (it can get cold at night), kimono, towel and special hair towel, torch, lap desk, solar reading light and to take home with you – a bookmark, pen and notebook journal. DAYPASS (All Food and Programs) is required and is automatically added to your overnight booking. For DayPass only see below. DayPass includes all our amazing programs and our world famous food: three delicious freshly picked organic buffet feasts and the all-day grazing table of snacks, juices, as well as, our unprecedented programs and scheduled events. 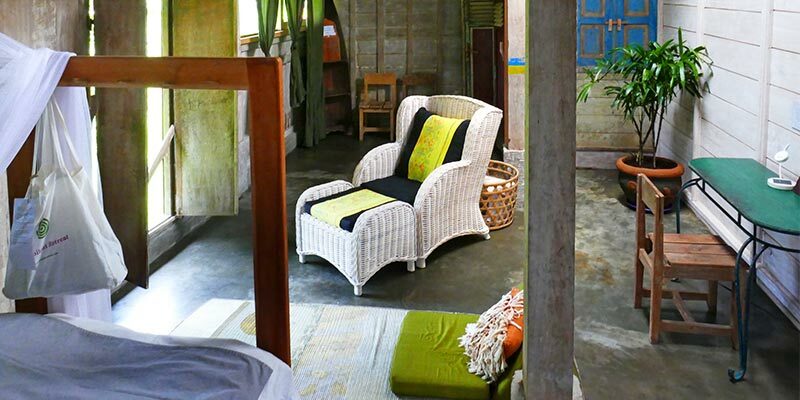 The DayPass, US$37, is automatically calculated into the total amount due in the online booking process. 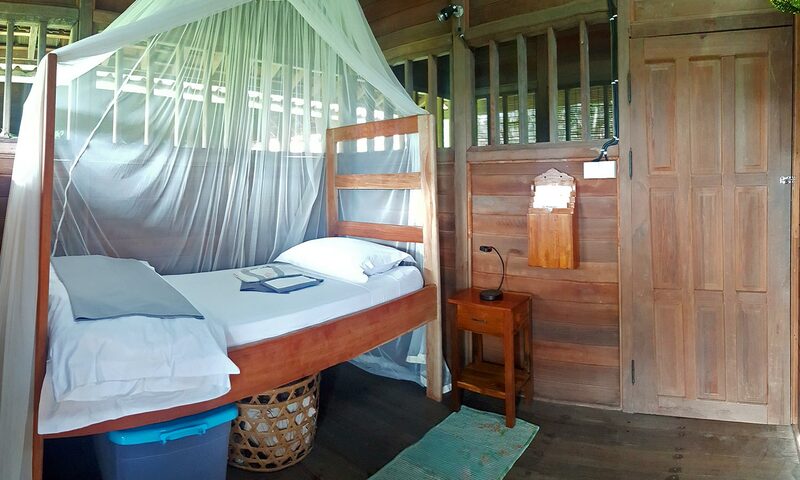 Private Bungalows for one person offers privacy, a single bed, mosquito net (not often needed), bathroom with open air hot shower, 5am tea served on the veranda, with a stunning view of mountain and rice fields. 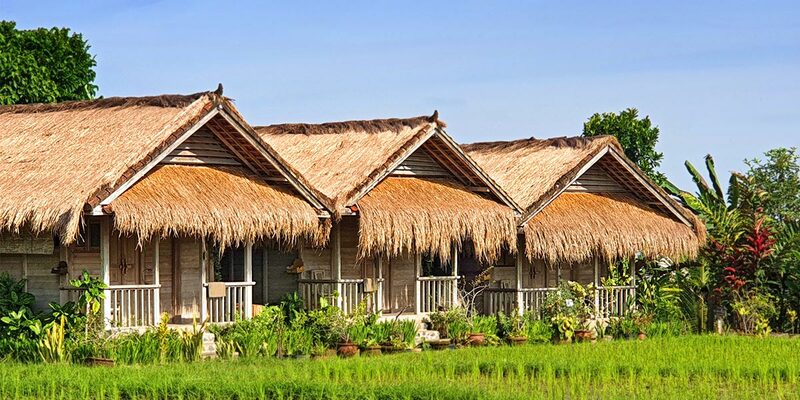 Only two of these private bungalows are available. 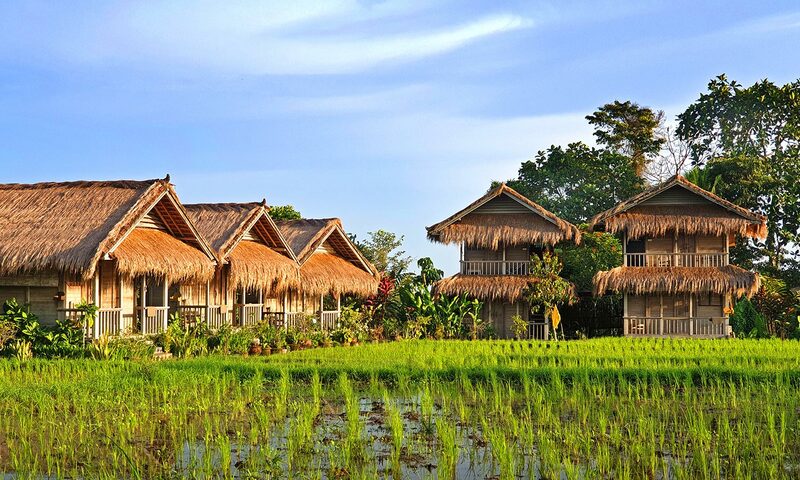 Deluxe Wooden Bungalows for 2 persons are two level with view over the rice fields towards the sacred Mt. 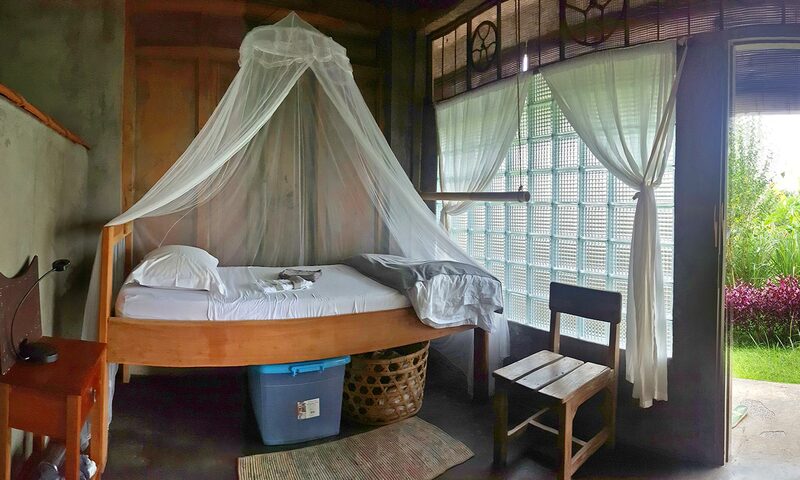 Batu Karu, lounging area, private bathroom – open air hot showers – with native plants, mosquito nets. 5am tea is served in a basket on the veranda. 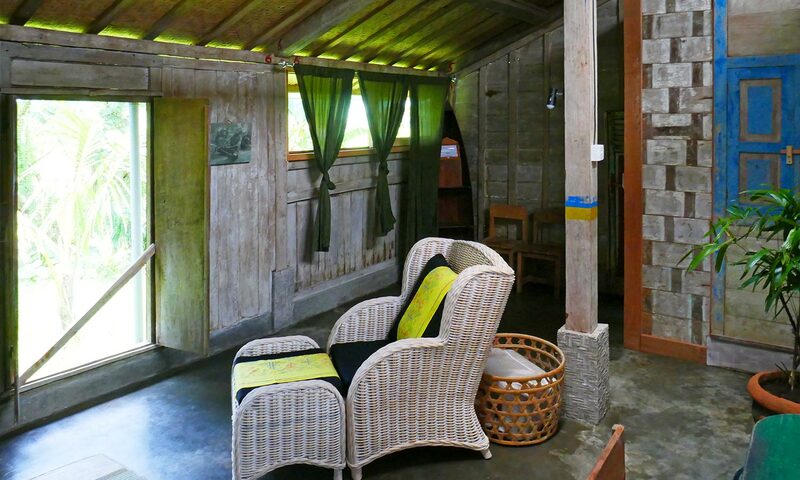 Deluxe Bungalow with Queen bed upstairs and lounging area downstairs with sleepable sofa. 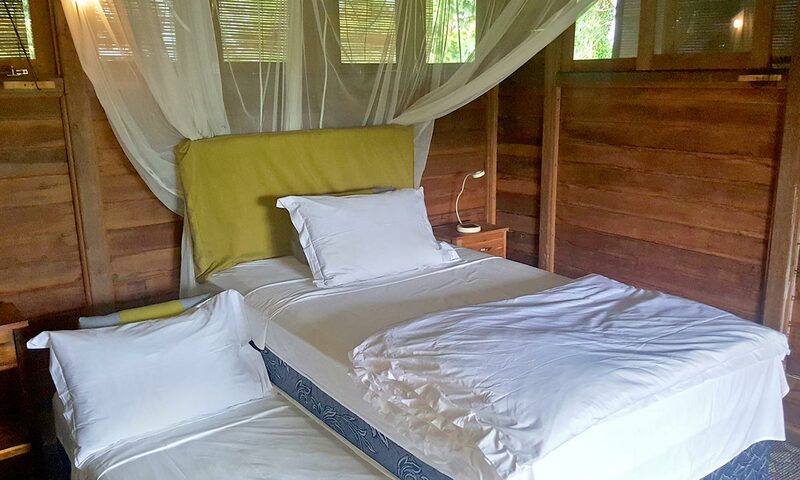 Deluxe Bungalow with Trundle bed (2 single beds) is an oversized single bed where a smaller bed rolls-out from under it; lounging area downstairs with desk and electrical outlet. 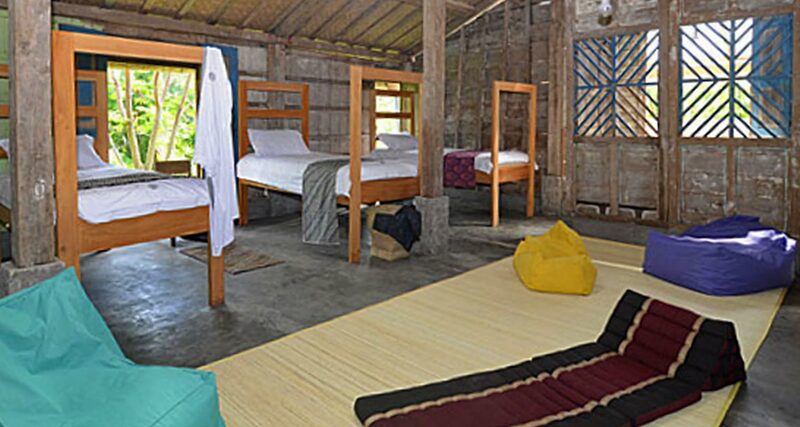 There are three types of single room with modest simplicity: All rooms have a single bed & mosqutio net, 100% cotton linens and down comforter and back rest cushion, a bright reading lamp, a large storage box for personal items, private bathroom with hot shower. Light sleepers are recommended to get ear plugs at the front desk. 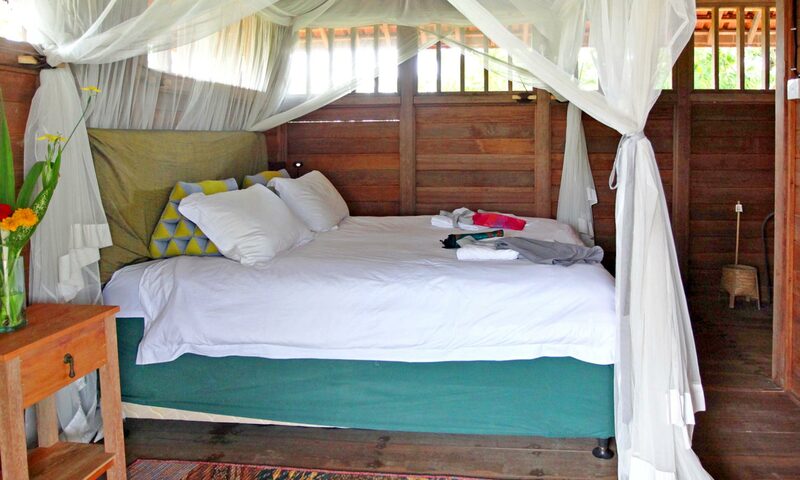 Snorers are recommended to book a Single Room Ground Level or a Private Bungalow. 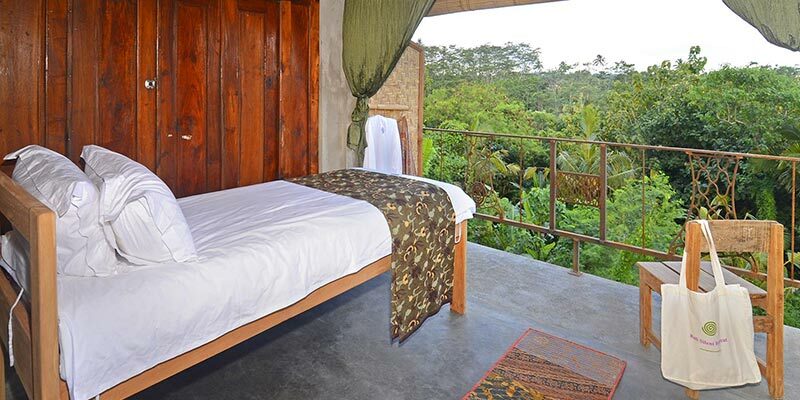 A private balcony with a view to the east over the jungle. 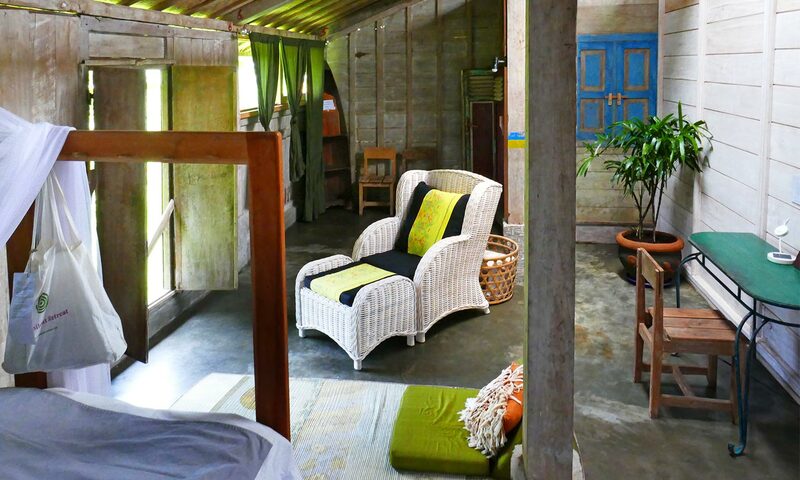 The rooms are light and airy with an open ceiling between rooms for air flow. Not recommended for light sleepers nor snorers. 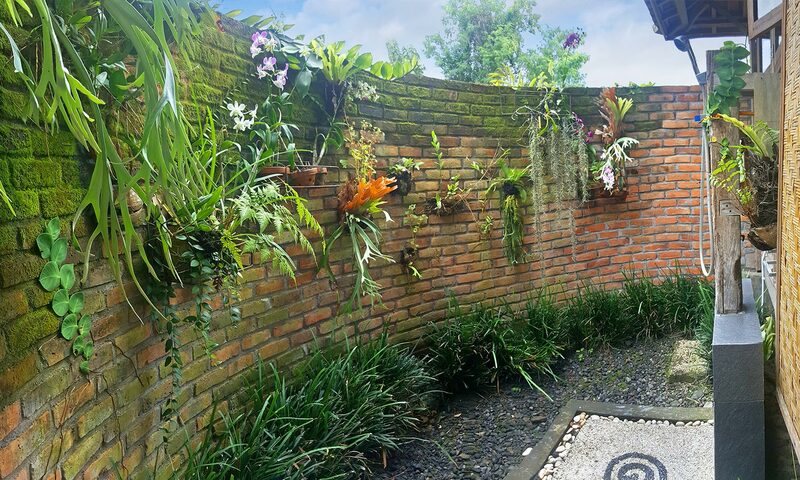 A garden porch and grass lounging area with jungle view. 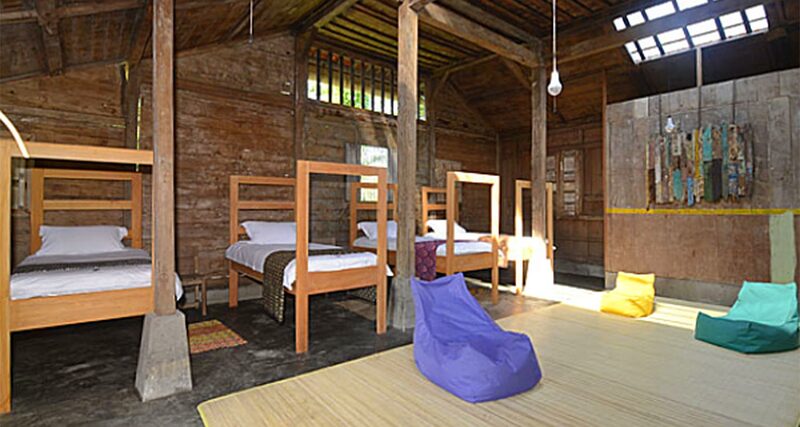 The rooms are designed for serious meditators; quiet, dark and cool, with a feeling of enclosed privacy. Recommended for light sleepers and people who snore. 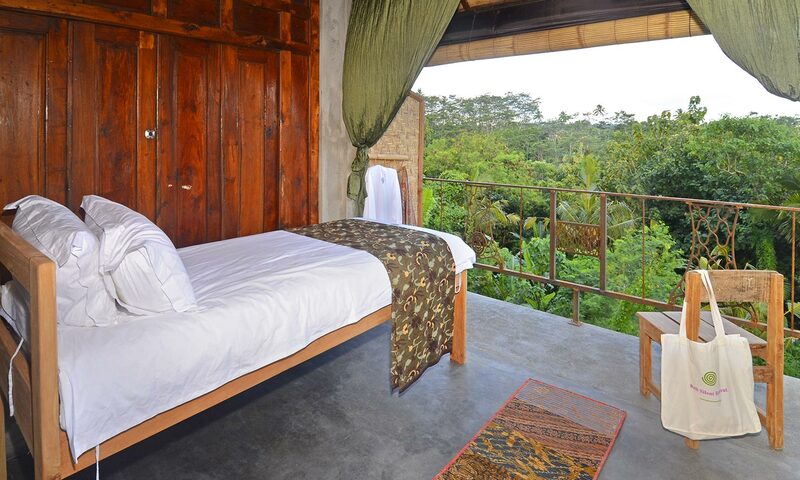 At the far edge of the property in an antique joglo teak house with views of the jungle. 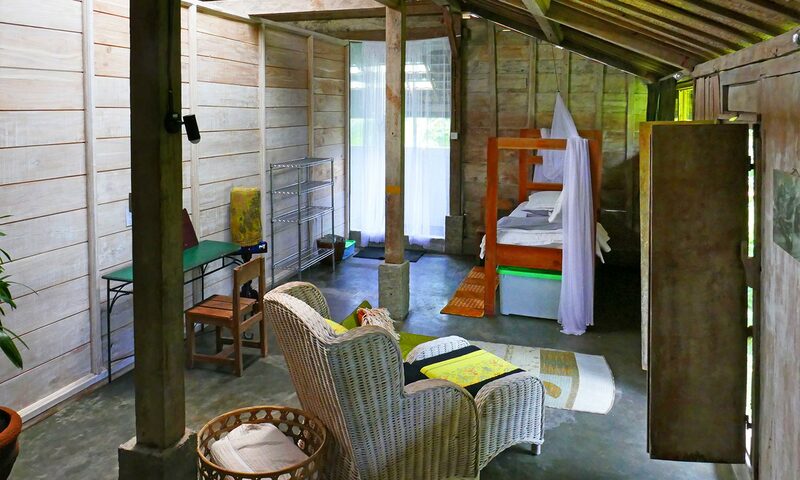 The rooms are spacious with a lounging area and desk. 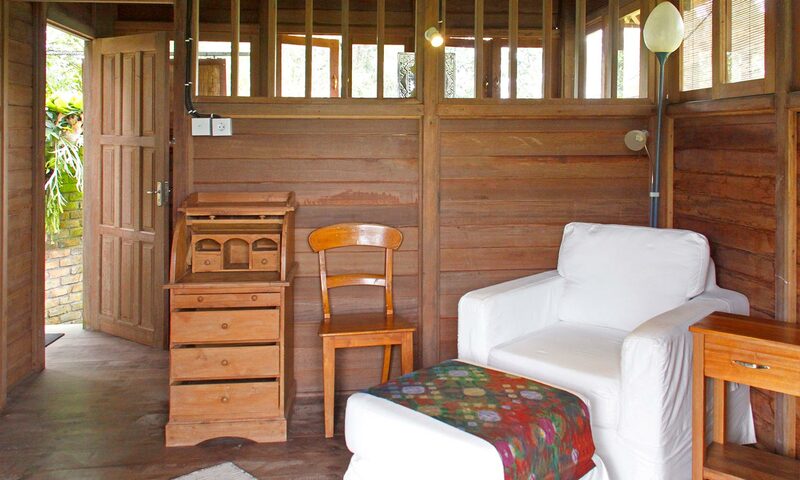 It has an open ceiling between the rooms for air flow. 5am tea is served in a basket on the veranda. 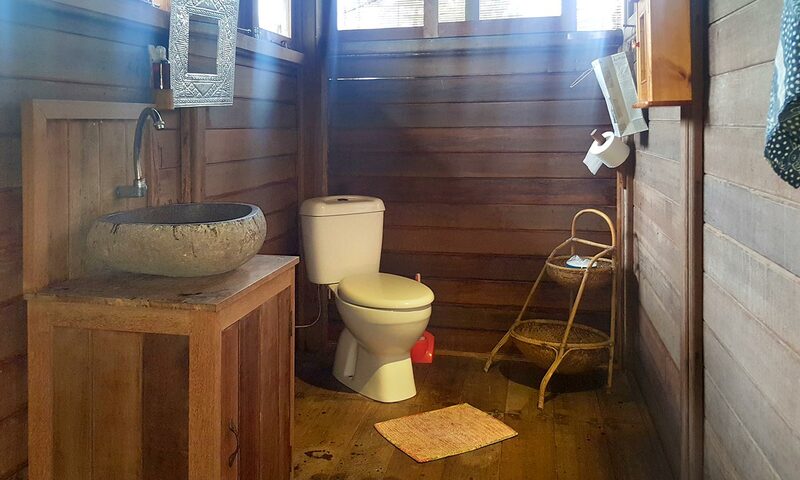 The building is a re-cycled antique teak-wood Javanese house with lounging area. 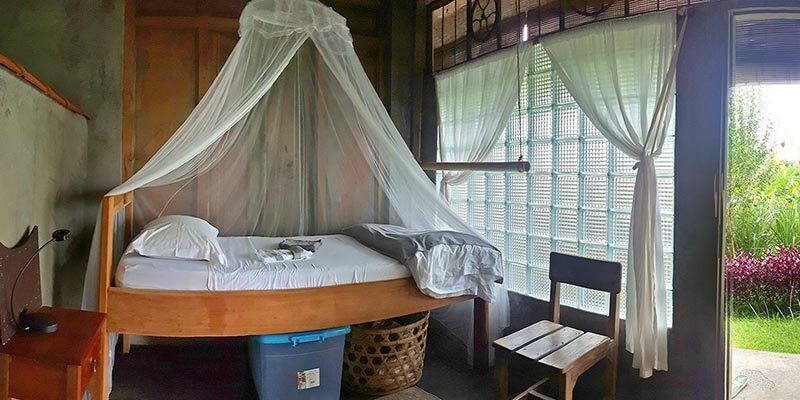 Each bed is a single wooden bed with mosquito net, a solar reading lamp and a large storage box for personal items. 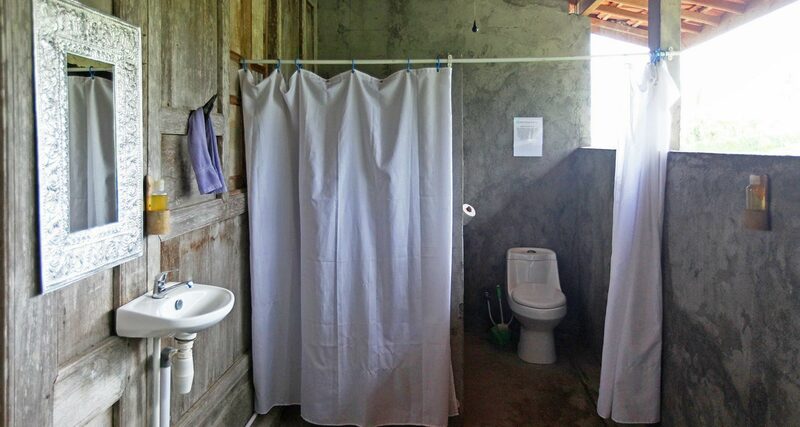 The shared bathroom has an open-shower-room with hot water showers and a stunning view of the jungle. 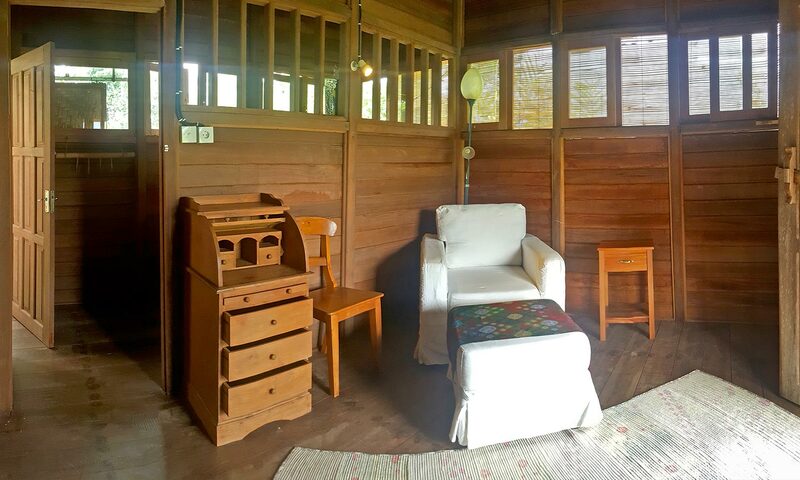 If your path to truth and awakening through silence and self-reflection is flowing for 6+ nights we can support your journey with a 10% discount on your accommodation. 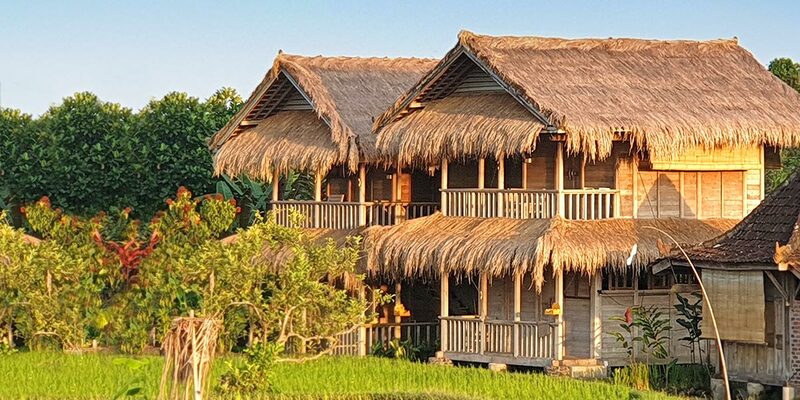 Single Rooms and Private Bungalows only. Apologies, we cannot discount the Dorms or your DayPass. Discount is calculated when you pay at check-in. 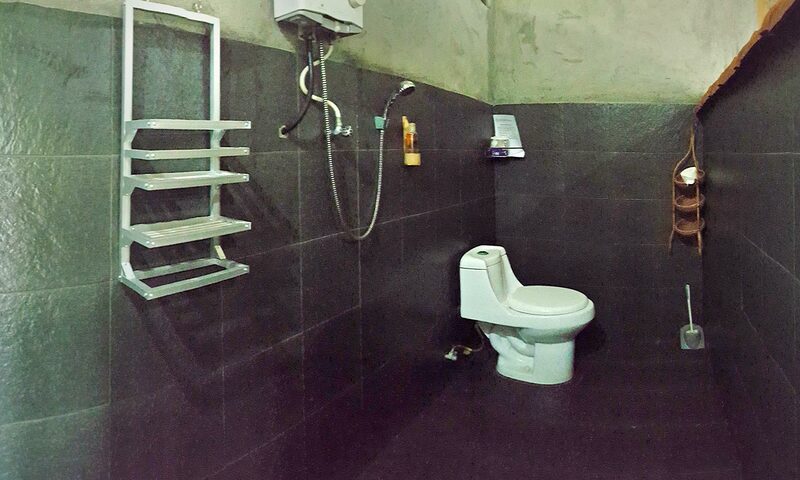 Rooms and DayPasses are subject to 17% government tax and service. Sorry, we no longer support groups. 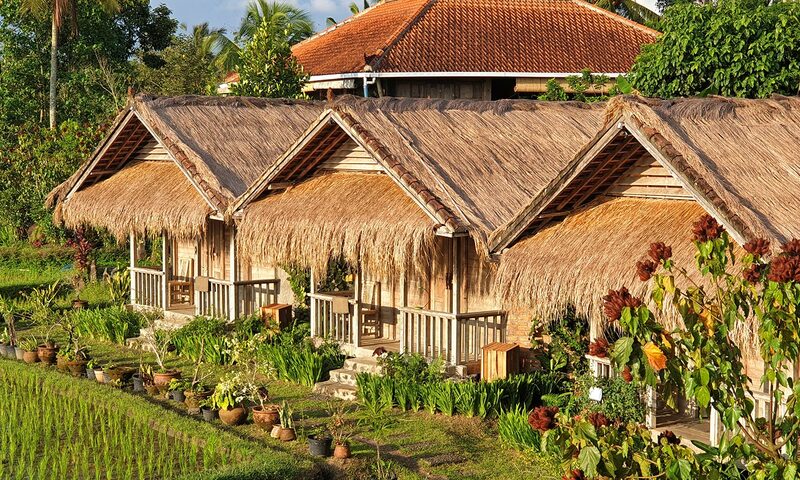 There are many other venues in Bali who’s facility is compatible with group dynamics. Check-in time is from 2pm, however you are welcome to arrive anytime to familiarize yourself with the philosophy, programs and grounds. No check ins after 5pm because office closes at 5:30pm. Try to arrive early so we have enough daylight to show you around and give you a warm welcome and full orientation. The Food & Programs DayPass is separate from the room rate but is automatically booked when the overnight room is booked. 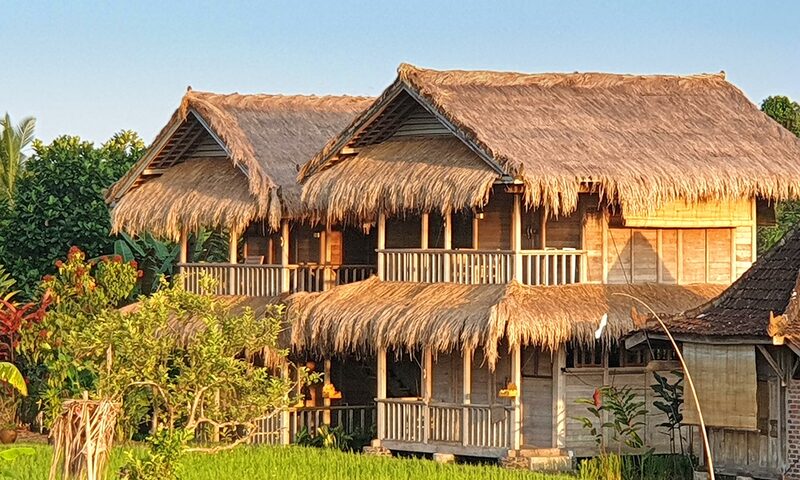 Our very affordable DayPass gives you access to all the different Programs and Events at Bali Silent Retreat during the entire day. From the early morning Meditation class at 6:00am until the Evening lecture or event at 6:00pm. 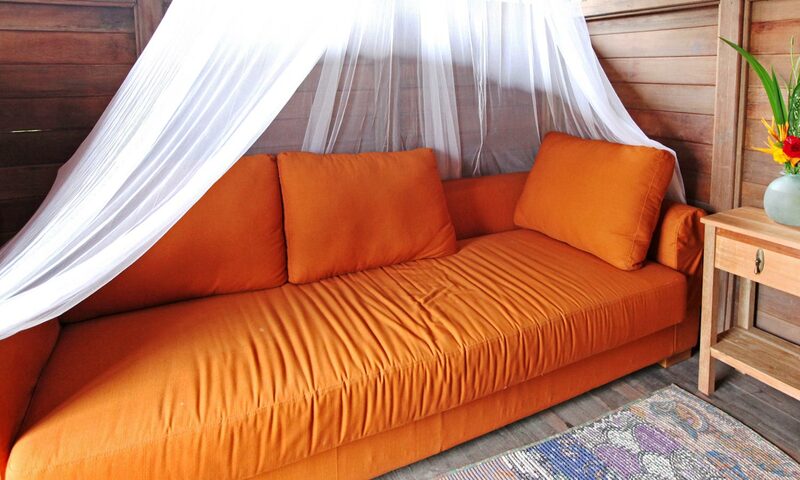 In between the programs you can enjoy our buffet table with organic breakfast, lunch and dinner, and also explore a multitude of activities on your own. Our delicious freshly picked Garden-to-Table organic cuisine. All the various Programs and Events. You are welcome to arrive for 6am Meditation & 7am Yoga, followed by buffet breakfast, however we will not have available staff at that hour to orientate you. Our office opens at 8:30am. If you choose to arrive early for the 6am class, there is a large map at the office and parking area which will guide you to the Meditation & Yoga Octagon Bale. Bring a torch if you have one. Our security team will be alerted that you have a booking and will wait for you until 6am, in order to guide you to the meditation octagon. If you haven’t arrived by 6am, we will assume your plans changed and the security guard will leave. At 8.30am, return to the office to say hello, receive an Orientation of the grounds & your bowls, mugs & cutlery and pay any balance due.